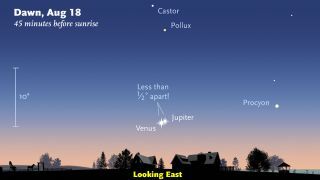 This sky map released by Sky & Telescope magazine shows how close Venus and Jupiter will appear in the predawn sky on Monday, Aug. 18, 2014. The two planets promise to be a dazzling sight in the early-morning sky. The two brightest planets, Venus and Jupiter, will appear super-close together before sunrise on Monday morning (Aug. 18), and it's just the kickoff for a week of early-bird observing by stargazers. This entire week is an exceptional time for predawn skywatchers to see the stunning sight of Venus and Jupiter together in the sky. The best time to see the two planets about 45 minutes before sunrise, when they will be visible low on the east-northeast horizon. For your reference, the full moon measures about one-half of a degree across in the night sky. Your closed fist held outstretched at the night sky covers about 10 degrees of the sky. On Saturday, Aug. 23, the gap between Venus and Jupiter will have widened to 5 degrees (roughly the separation between the two pointer stars in the bowl of the Big Dipper). On that night a narrow crescent moon will join the two planets, making for a striking triangle configuration in the morning twilight. Generally speaking, at least for the immediate future, cosmic meet-ups (known as conjunctions) between Venus and Jupiter will come in pairs. The first pairing takes place in the morning sky, usually followed about 10 months later by another in the evening sky. When Venus and Jupiter next get together, it will be in the evening sky late in 2016, a few days before Independence Day (July 4). July 1, 2015: Visible in the evening sky; Separation: 0.3 degrees. Oct. 25, 2015: Visible in the morning sky; Separation: 1 degree. Aug. 27, 2016: Visible in the evening sky; Separation: 0.06 degrees. Nov. 13, 2017: Visible in the morning sky; Separation: 0.3 degrees. Jan. 22, 2019: Visible in the morning sky; Separation: 2.4 degrees. Nov. 24, 2019: Visible in the evening sky; Separation: 1.4 degrees. This image shows a close-up of how Venus and Jupiter will appear as viewed through a low-power telescope before dawn on Monday, Aug. 18, 2014. The astronomy magazine Sky & Telescope released this guide for stargazers. Take note of the lone "renegade" conjunction that occurs in the morning sky of Nov. 13, 2017, with no evening get-together 10 months later, in September 2018. Also, the closest approaches between these two planets come during the evening apparitions. So although their next conjunction comes about 10 months from now, the next time Venus and Jupiter will appear as close together as they will this week, won't come until August 2016. On that date, the two planets will be separated by just 4 arc minutes or only about one-eighth of the moon's diameter! Editor's note:If you capture an amazing view of Venus and Jupiter together in the predawn sky and would like to share the experience with Space.com, you can send images and comments in to managing editor Tariq Malik at: spacephotos@space.com.